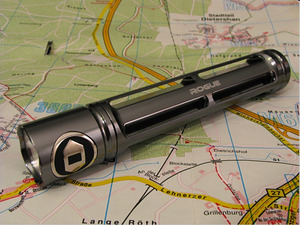 Whether I’m consulting a map, shining light on a camp sign, reading late into the night, or searching the bottom of my backpack, this sturdy little flashlight is what I use to light my way. I like it so much that we have one for home and one that lives in my travel bag. Equipped with an ultra bright LED, the Rogue is über efficient, at least ten times more efficient at converting energy into light than regular bulbs. Better yet, its aerospace aluminum body means it can be dropped, thrown and rattled around in the trunk without any damage. And the waterproof O-ring seals, mean I can use it in the rain in London, a Utah snowstorm or drop it in a Panama puddle and it keeps on working. Favorite feature: I love that fact that it’s powered on one (Rogue 1) or two (Rogue 2) AA batteries, something I can purchase virtually anywhere, anytime. Not-so-favorite feature: Not available on Amazon - my go-to source for nearly anything - but you can get one at Radio Shack. Go figure. Bottom line: It’s a handy little powerhouse that’s built to last.